On July 26th, come on up for the a Bicycling Ride-A-Thon, Festival, Campout and you name it. There are lots of options: choose the simplest of 8 routes (23 miles) or the most arduous at a hill-atious 100 miles. The start and finish site is at the end of our own Wassaic Train Station to Millerton Rail Trail segment—in Millerton’s Eddie Collins Field (5800 South Elm Avenue Millerton, NY 12546 )—which is also the locale for the Free Camping on Saturday Night. There will be luxury bus transportation from NYC (55 passengers per, with the bikes coming up by truck following) for the first 100 riders to sign up. The 8 routes this year will make it interesting for whatever level of biker you are; each utilizes a portion of the “Rail Trail” or as my earlier blog noted the new name Recreational Trail. But Rail Trail it is, especially with RAIL RIDE, and that’s the real deal. 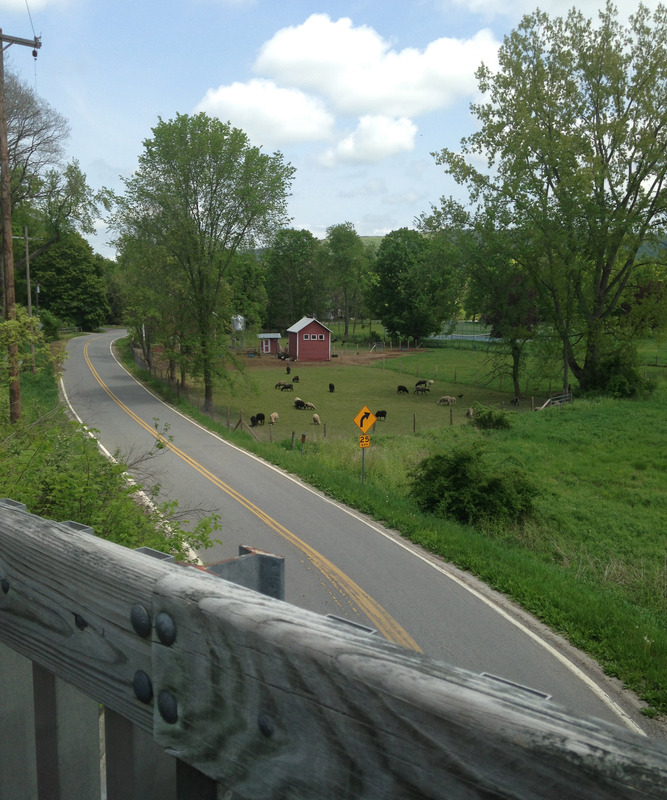 Some of the routes are very challenging, UP and DOWN (whee) the Berkshire foothills (they’re mountains!). The inclines—or elevation gains as their website calls them— vary from 6925 ft. to 666 ft on the 23 mile run, and each has been creatively mapped out to offer up scenic views, comforting rest stops, and even opportunities to swim in the Millerton pool—oops, not unless the leak is fixed before then!! !– eat some gastronomically appealing and energizing meals (breakfast, lunch and dinner). Don’t forget the beer garden and the masseuses who are there to ease your tired bones. They’ve thought of everything, so come up, use the bag check and hang out with your free T-shirt for Rail Ride 2015! And if you’re not up for camping, or the weather Saturday night is doubtful, you can still book a room with us. As you know, Hilltop House Bed and Breakfast is a stone’s throw from the HV Rail Trail and we’ve had many a visitor take us up on the free bikes we provide on a first come first served basis. We’re listed on the site as one of the hotels, and inns in the area. Also just found under the Camping window, that if you pre-register, the Rail Ride organizers are providing a free shuttle to the warm-up ride on Saturday and will pick up from the Wassaic Train station and drop your bags off at Hilltop House!!!! So Register Early!! Check that out!!! The Rail Ride has a festival atmosphere with barbeques and events for the kids (free when accompanied by registered adults). When I get the chance, I sometimes watch House Hunters or House Hunters International and I’ve been noting the number of “buyers” who are looking for places close to a hiking trail. Since Hilltop House is so close to the formerly called Harlem Valley Rail Trail, I have been doing a bit of research. Seems that a year ago in June of 2014, the National Parks Service, which runs the rail trail, changed its formal name to ” Harlem Valley National Recreation Trail,” adding in the process, 452 odd miles in 11 states to a growing network of these trails. Their stated modus operandi was to get people connected with nature, but it surely must have a lot to do with getting us off our tooshes (how do you spell tooshes?) so we can get in shape end this obesity crisis in America. Enough on that–I run a bed and breakfast and I love to bake, never mind eat! So a little on hiking: I found a great website called hikingwebsite.com which posed all the basic issues, i.e. benefits of hiking, difference between a walk and a hike, what you have to think of in advance of hiking, so it was a nice simple way to acquaint yourself with getting into the go of it. One of the benefits they stress (though stress is something hiking alleviates) is being prepared–if it’s hot, taking water–if it’s going to get cold when later in the day, bringing a jacket–anticipating the time you’ll need, and bringing food along–or in the case of our Rec Trail that leads into Millerton, a town with a range of tasty eateries and great antiques, you might want to bring some money along. Walking to Millerton (about 7 miles) will require a cabride back. But as the National Parks and Hiking website both tout, the road to Millerton connects the hiker with nature. It’s a truly beautiful tromp by dairy farms, cornfields, back woods, and wetlands. You might need bug spray. If you take our bikes–free to the first come first serve–you’ll get to and from Millerton, and have time enough to catch a bite too. From a bite to a bit about our branch: In 1845 the railroad was voted by the NY legislature to be built from the thriving suburb of Harlem north to reach 125 miles into Chatham NY. The “Harlem Valley” as it was nicknamed, was chosen over the more precipitous Hudson River path, but the more affluent cities on the Hudson, including Poughkeepsie, raised private funds to build the Hudson River line. It was completed about the same time as the Harlem Valley line, and it became more popular. The late 60s brought more highways, and after changes in rail ownership, the Harlem line from Chatham to Millerton was eliminated in 1976. Further cutbacks took the terminus back to Wassaic–then to Dover Plains–then reinstating it to Wassaic again. For all of the time we have been at Hilltop House, Wassaic has been the end of the Harlem line. In Dutchess County, The Rail Trail as it was known, and is still referred to, began where the rails ceased to be, right there in Wassaic, into our neck of the woods, Amenia, then on to Millerton. When the trail pases into Columbia County where the Taconic State Park gains possession of where the rail beds were, then picks up briefly in Copake. But we recommend getting out while you’re here at the bed and breakfast. There’s that great, short hike to Stone Church we’ve written about before, and even the walk to town to eat or antique can involve a nice hilly loop around so you don’t have to see things twice! Come on up and Take a Hike!